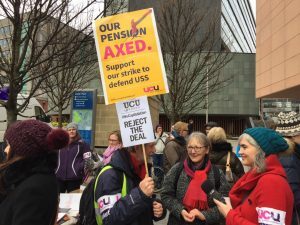 You may have heard that some UK universities, including Newcastle, are involved in a pensions dispute (see https://www.chroniclelive.co.uk/news/north-east-news/newcastle-durham-university-strikes-begin-14323108 for just one of the Chronicle articles on this issue). As oral historians, we are always interested in hearing people’s voices–literally as well as figuratively. We knew that the experience of 14 days of striking had been a significant one for many other those involved–we knew through our own informal conversations, through Twitter posts (see the #USSstrikes hashtag for some of this), and indeed through our own varied experiences. But when we decided, on Monday 12 March, that we would take our recording equipment the next day’s picket, we had no idea what was about to happen. 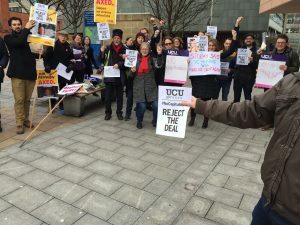 On Monday evening, a ‘deal’ was announced as a result of ACAS (Advisory, Conciliation and Arbitration Service) facilitated negotiations between Universities UK and the University and College Union (UCU). Our recordings on Tuesday morning, all taken during the hour between 9am and 10am, capture the mood just before the significant, unanimous vote to reject the deal. We asked only two simple questions: ‘what has been your experience of the strike so far?’ and ‘what do you think about where we are at today?’ But what was initially conceived as a simple story-telling exercise on behalf of the UCU became potentially more important. Talking pensions on the picket line. These recordings are not oral histories and were not conceived of as an official project of the Oral History Unit. (After all, we were on strike.) Each interview is only a few minutes long, rather than the hours or even days that can be devoted to life story interviews. But for those few minutes, participants were given the chance to reflect, aloud and in the space of a picket line, on their experiences of this particular strike action. We hope this was a valuable experience for them; it was certainly exciting and energising for us. Potentially, the participants could be contacted later for more detailed and considered interviews. At that point, these ‘snapshots’ might be used a bit like old photographs, as a starting point for conversation. Was this a historic moment (hour)? That will be up to future historians to decide. This entry was posted in News, Oral History Collective, Podcast, Public History and tagged oral history, strike, ussstrike, voxpop by Alison. Bookmark the permalink.